The following description of the experimental setup is borrowed (with kind permission) from NASA's CoolCosmos website. It also provides a guide for teachers on the experiment. In the year 1800, Sir William Herschel discovered the existence of infrared in an astronomical source by performing an experiment very similar to the one we show here. Herschel passed sunlight through a prism. As sunlight passes through the prism, the prism divides it into a rainbow of colors called a spectrum. A spectrum contains all of the colors which make up sunlight. Herschel was interested to find out whether the sun would also give off a kind of invisible radiation that could be felt as heat. 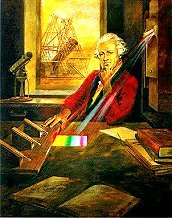 William Herschel measures infrared light from the sun - artist's impression. 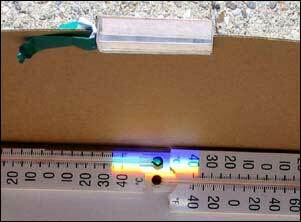 To do this he used thermometers with blackened bulbs and measured the temperature of the different colors of the spectrum. He noticed that the temperature increased from the blue to the red part of the spectrum. Then he placed a thermometer just past the red part of the spectrum in a region where there was no visible light and found that the temperature there was even higher. Herschel realized that there must be another type of light which we cannot see in this region. This light is now called “infrared”. It is quite easy to recreate the Herschel experiment. All you need is a glass prism, three alcohol thermometers, a white piece of paper and a box. Paint the thermometer bulbs with black paint to make this experiment work. The experiment must be conducted outdoors on a sunny day. Begin by placing the white sheet of paper flat in the bottom of the cardboard box. Carefully attach the glass prism near the top edge of the box on a cutout notch. It should hold the prism snugly, while permitting the prism’s rotation about its long axis. 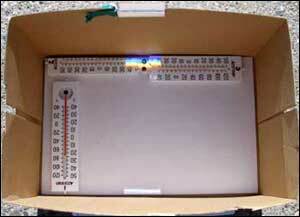 After the prism is secured in the notch, place the thermometers in the shade and record the ambient air temperature. Then place the thermometers in the spectrum such that one of the bulbs is in the blue region, another is just beyond the (visible) red region, and the third remains in the shade. It will take about five minutes for the temperatures to reach their final values. Record the temperatures in each of the three regions: shade, blue, and "just beyond" the red. Do not remove the thermometers or block the light while reading the temperatures. What do you expect to happen? Which thermometers will rise with time? 1. What is the difference between the final temperature readings from the thermometer in the shade and the one in the blue? 2. What is the difference between the final temperature readings from the thermometer in the shade and the one just beyond the red? What are your results? What do you notice about your temperature readings? Do you see any differences between the thermometer just beyond the red and the one in the shade? If so, where does that difference come from? After all, in both cases, you cannot see any light on the thermometers! We would love to hear about your results. Send us your initial and final temperature readings and we will post them to show everybody that, after more than 200 years, William Herschel's experiment still works!